20.07.2013. Martin Georgiev’s London Songs on Bagryana Poems, Soprano, Violin and Piano, were performed in a recital by the Stankov Ensemble at the Varna Summer International Music Festival, Varna, Bulgaria, the native city of both the composer and all the members of the ensemble. 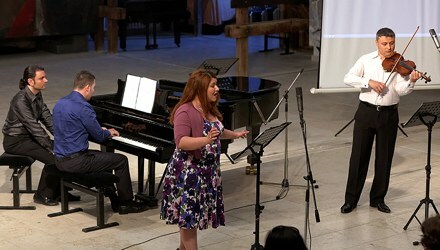 The world premiere of the song cycle, commissioned by the AmBul Festival for American and Bulgarian Music in Sofia, Bulgaria for the Stankov Ensemble was given by them within the framework of the festival, at the Philip Koutev Hall at UBC, Sofia, Bulgaria. The performance in Varna was staged with an abstract videoscape by Evgeni Vassilev and Natalia Kisinova.